By the Super Sidearms, we give you Half-Pi D Mini Golf. 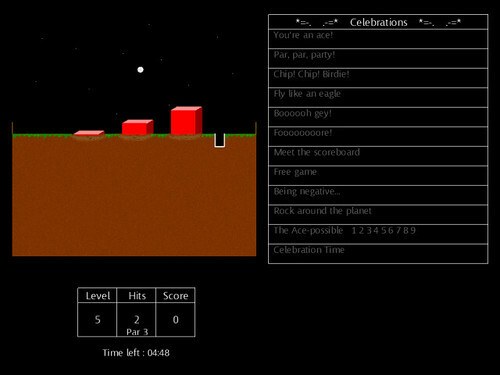 Enjoy this 9 holes mini golf course while trying to unlock Celebrations. Each hole is unique and represents a different challenge. If you are good enough, and you unlock every Celebrations within the 5 minutes time limit, you will enter a special secret mode for the remainder of the game duration. You can download the game using this LINK. If you want to get in touch with us by email, send it to [email protected]. Would love an option/method to slow the power bar down for players finding it a bit quick, please. Any chance? Thanks for the feedback! We're glad you enjoyed the game. It was a fun project to work on too. Adding the ability to choose the difficulty level (speed of power bar) is definitely something we want to add. We'll post an update here when that happens. We just released a new version with the ability to choose the difficulty level between easy, medium and hard (using up/down on the DPad or keyboard). 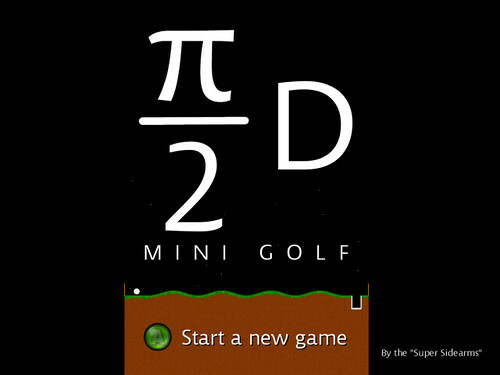 There is now an iPhone version of Half-Pi D Mini-Golf, available for only 1$ on the App Store! Visit http://sites.google.com/site/halfpidminigolf for more info.